When Julia and I embarked on our big western road trip in search of leafminers in the fall of 2012, we kept encountering what appeared to be sawfly mines on Vaccinium species in western Washington. The plants are known as huckleberries out there, but where I come from huckleberries are Gaylussacia and most shrubs in the genus Vaccinium are known as blueberries. To be fair, the berries of V. parvifolium are red, but the berries of V. membranaceum are more or less blue (and also happen to be delicious). Anyway, the sawfly mines were on both of these “huckleberry” species. 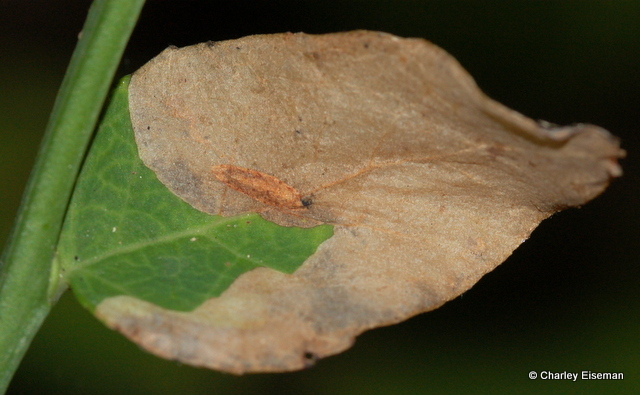 I knew there wasn’t supposed to be a sawfly leafminer on Vaccinium, so we collected a good number of the leaves that still had larvae inside. 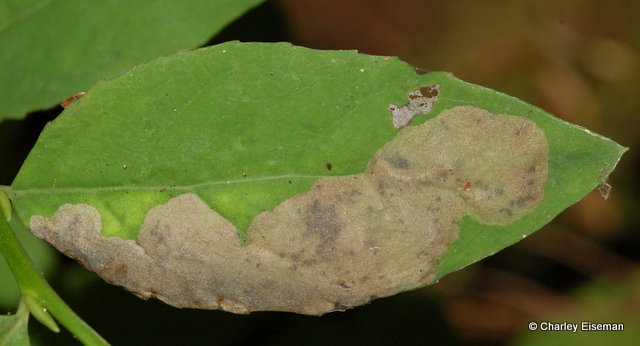 One by one, the larvae matured and popped out of the leaves. I offered them little jars of soil to burrow into, and waited for adults to emerge. In the meantime, elongate little cocoons appeared in some of the mines. Before long, braconid wasps started emerging from some of these cocoons. In December, I put everything in the refrigerator to overwinter. A few months later, I took everything out. 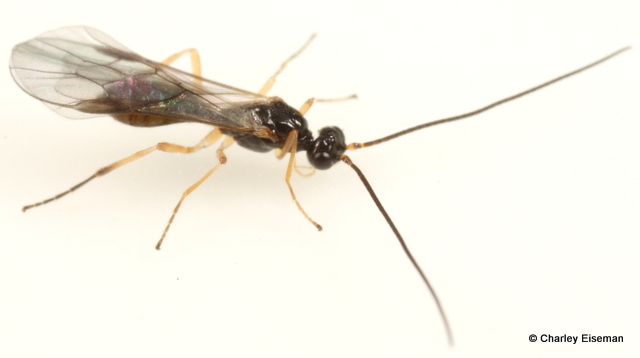 Some more of the same braconid wasps emerged, but no sawflies. 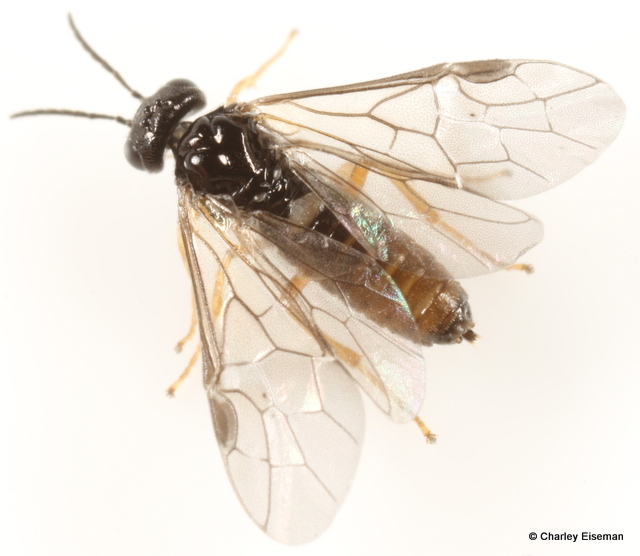 So it seemed I might never know what species the sawfly was, although I was inclined to suspect Prolatus artus, a species described from Oregon whose host is unknown. There are only 30 or so species of leaf-mining sawflies in North America, so there were only so many options. …and I offered it the finest mixture of moistened sand and peat into which to burrow. (On the road, I had used locally available soil, which was more difficult to keep at a good moisture level.) Come November, no adult had emerged, so into the fridge it went. I took everything out in February, in the hope that all the bugs would be done emerging before Julia and I headed to Ohio to get married in April. The sawfly had other plans, so the jar of soil traveled to Ohio with us. Just before we had to leave for some wedding-related event, I glanced at the jar on the windowsill and saw that the sawfly had emerged. I quickly took a few photos of it before preserving it and leaving for the event. Once back home, I sent the sawfly to Dave Smith, the American sawfly expert, who determined that it belonged to the genus Scolioneura. There were only four known species in this genus, one of them from northern Iran and three from Europe. One of the latter is introduced in Canada and feeds on birch; the known hosts of the others are birch, alder, and willow. After consulting descriptions and borrowing European specimens, Dave determined that the huckleberry miner was something new. 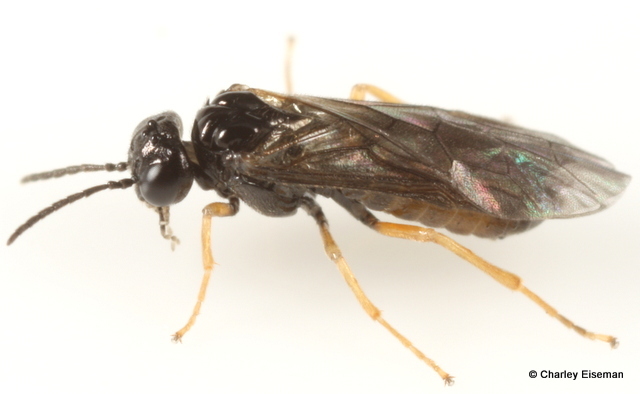 We put together a paper describing it, and it was published today*–so I can now officially report that the sawfly in question is Scolioneura vaccinii Smith & Eiseman. Mystery solved! 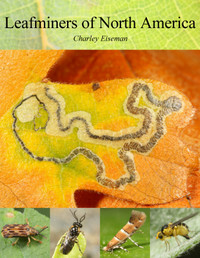 The sawfly even made the cover of the Journal of Hymenoptera Research. This seems to be the only available image of the cover, but it lets you see the sawfly closer to life size… although this is still about three times larger than life. Incidentally, José Fernández-Triana at the Canadian National Collection determined that the braconids belong to the genus Shawiana. They almost certainly represent a new species too, since there are just two known North American species in this genus, both in the eastern US (and one of those is introduced from Europe). There’s no telling when they might get a name, though, since no one in North America works on that subfamily of braconids (in fact, no one can even agree on what that subfamily is–depending on who you ask, it’s either Exothecinae or Hormiinae; Mike Sharkey, who specializes in Agathidinae, declared that both subfamilies are very wrong). 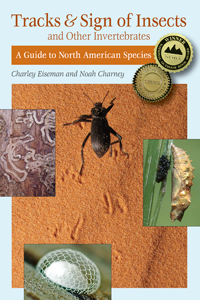 This entry was posted in Uncategorized and tagged Braconidae, cocoon, Ericaceae, huckleberry, Hymenoptera, larva, leaf mine, new species, parasitism, parasitoid, red huckleberry, sawfly, Scolioneura, Scolioneura vaccinii, Shawiana, Tenthredinidae, Vaccinium, Vaccinium parvifolium, wasp. Bookmark the permalink. Thank-you for all your dedication to obtaining , protecting and nurturing this mysterious insect along until you came up with an answer ! LOL ! That is true dedication to bring the larva along with you on your honeymoon ! Fantastic! A new species. Pretty cool to have it tied to your name. I really enjoy Bug Tracks. Great work, Charley, congratulatons! Bug Tracks is my favourite blog – you’re doing wonderful and interesting work.